The last time we updated you on our new offices blog, the fellas were steaming ahead skimming/plastering the internal walls and ceilings. 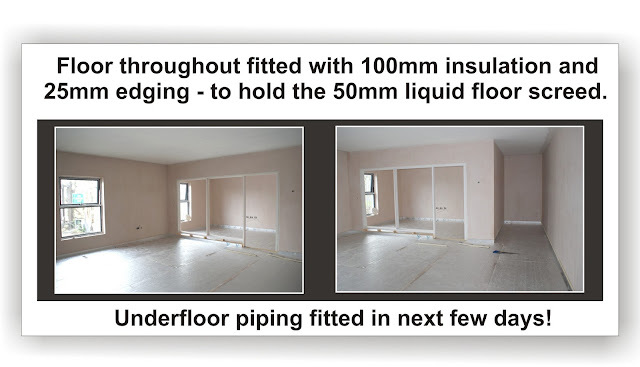 Never to disappoint and continuing to work flat out, the team have now fitted the floor with extra thick 100mm insulation and 25mm edging - in preparation for the fitting of the piping for our underfloor heating and liquid screed. Each office area within our new premises will be fitted with a thermostat - allowing the staff to decide themselves their preferred comfort level. Why we want UNDERFLOOR HEATING! Underfloor heating is far more efficient than traditional and expensive oil or gas fired central heating, and gives a greater feeling of comfort. Considerable fuel savings are expected, as less energy is required to achieve the same feeling of warmth. NEXT TIME at air cool engineering (NI) Ltd........find out about the award winning heat pump system which will provide our heating and hot water at our offices!